Watching Daniel Eatock’s ‘Burnout Circle Drawing’ in the Monster Truck Gallery, Temple Bar, it struck me that it was wholly appropriate that this kind of activity would take place in the former Original Print Gallery. The gallery, which has since forsaken the physical world and migrated online, was once an exhibition space and outlet for the artists of the Black Church Print Studio in the building above it and for many other printmakers across the country. These included some friends of mine, former devotees of that alchemical art, who expressed a dismay bordering on anger when told about Daniel Eatock’s plans for his show in Monster Truck Gallery. They refused to believe that a ‘burnout’ in a gallery space could constitute valid artistic expression. Although they expressed deep suspicions of such a gesture as being brash and pretentious conceptual art, I couldn’t help thinking that they secretly despaired the passing of a space for an embattled practice, a space in which they once exhibited their work. However on witnessing the spectacle of the burnout on Culture Night, I couldn’t help thinking that, if my friends could forgo the easy prejudice of artistic domain specificity, they would actually find that Eatock’s burnout was consistent with the practice of printmaking; it’s focus on the medium, ‘quality of line’, and somewhat dangerous technique (considering the material involved). After all intaglio printmaking is based on the act of carving through a layer of wax to expose the copper beneath, ready for the hydrochloric acid that etches the mark deeper. The quality of the imprinted line is both the product of the hand that lays it down, and the interaction of the various media of wax, copper, acid, ink and paper. 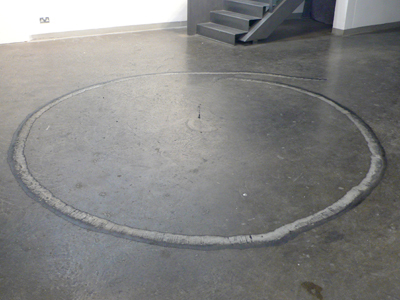 The circle etched into the gallery floor by a one thousand cc motorcycle, created by the combined interaction of; stunt driver, the somewhat dangerous technology in his hands, the quality of the exposed concrete and the bitumen like rubber residue left in its wake, makes for a suitable tribute to The Original Print Gallery.